In May, agencies got creative with alternative advertising mediums. While there were still plenty of traditional video and print ads on our radar, some crafty designers and copywriters turned to apps, bottled scents, modeling clay, and even an icy road trip to get their messages across. Among other things, this month’s roundup features an accidentally viral print ad, an unusual Tinder profile, and a pop-up travel agency that uses custom scents to encourage spur-of-the-moment excursions. Check them all out below. In a clever stunt to generate some tourism buzz, the entire country of Sweden recently listed itself on Airbnb. Gothenburg-based agency Forsman & Bodenfors (you might know them as the agency behind Volvo’s “Epic Split” ad) developed a stunning video to advertise the listing, showcasing Sweden’s natural beauty and explaining Allemansrätt — The Right of Public Access that enables Swedes and visitors to explore the countryside freely. While most hair care ads depend on formulaic, slow-mo shots of unnaturally swishy, sparkly, CGI-enhanced hair, this new work for Syoss by walker Zurich highlights a hair dilemma most of us can actually relate to: where do you find the time to properly style your hair before your morning commute? Sudan is the last male Northern White Rhino on Earth, and he needs some help finding a mate. So naturally, he joined Tinder. Since Sudan can’t mate under normal conditions, scientists at Kenya’s Ol Pejeta Conservancy need to raise money for research into Artificial Reproductive Techniques to help him breed through one of the 7,000 Southern White Rhinos currently in existence. Ogilvy Africa launched a campaign around the effort, starting with signing Sudan up for a Tinder account. When users on the dating app swipe right to “match” with Sudan, they’ll be sent a link to donate money via the app’s messaging system. Chris Wall, Ogilvy’s late vice chairman who passed away earlier this month, was notably one of the writers on the viral campaign. Particular smells can conjure vivid memories and stir up old emotions, but can they spur us to travel somewhere new? In this inspired campaign for French rail company Thalys, Paris-based agency Rosapark set out to bottle scents that captured the essence and energy of different European cities. Thalys then set up a pop-up travel agency in a Brussels art gallery, inviting people to select trips on the spot based on their favorite bottled scents. The stunt is captured in the artful spot below. In an effort to change the perception that you can’t learn new skills after a certain age, German pharmaceuticals company Merck Consumer Health teamed up with Ogilvy Italy to film this “social experiment” with parents of the Turin diving team. Thanks to some seemingly lazy but actually ingenious copywriting, this simple ad for an English pub went viral in May after someone uploaded an image of it to photo-sharing website Imgur. 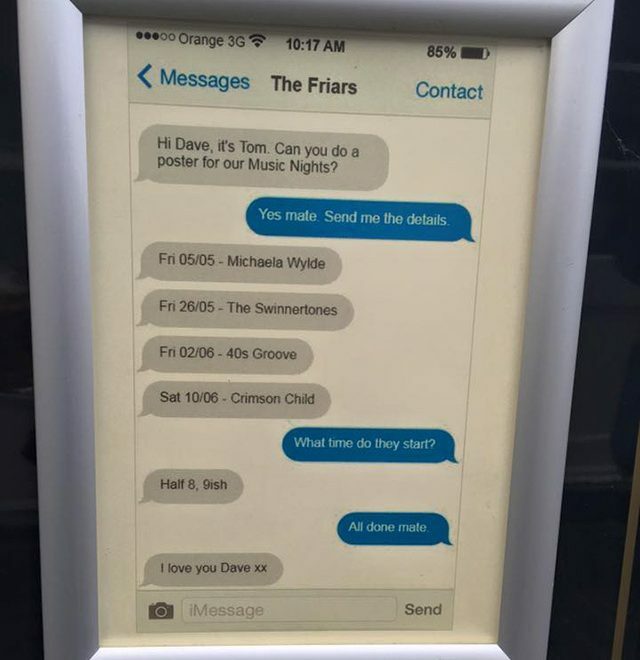 The ad features a text conversation between the owner of The Friars, a Bridgnorth-based pub, and designer Dave Blackhurst. At first glance, it looks like Blackhurts simply used a real conversation as the ad, but it turns out he cleverly fictionalized the whole thing. “The irony is I don’t have a smartphone, I have a Nokia C2, so it took me about three minutes to come up with the idea but a few hours to put it together with an online message generator and Photoshop,” Blackhurst said to a local paper, The Shropshire Star. In an effort to bring hotdogs to every remote corner of America, Oscar Mayer’s team of professional “Hotdoggers” (yes, this is their official title) hopped into the iconic Wienermobile and trundled off towards Whittier, Alaska. The branded adventure, orchestrated by Mcgarrybowen, Olson Engage, and Starcom, was documented in the below film. Watch as the two Hotdoggers — Kayla and Franscico — heroically navigate precarious roads on their quest to bring nitrate-free joy to Whittier’s 220 citizens. The whole thing is like a fever-dream version of Ice Road Truckers — in a good way. In honor of the company’s 60th birthday, Play-Doh teamed up with DBB Paris to create a series of epic, imaginative sculptures for use in a print and poster campaign. In this charming, energetic spot from Apple, the iPhone 7 plus’ new Portrait Mode setting helps transform a quiet neighborhood barber shop into a popular destination. When one of the barbers starts snapping professional-looking pictures of satisfied patrons and displaying them in the window, word quickly spreads — and pretty soon there’s a line around the block. The ad excels at showing how easy it is to use Portrait Mode, without boring us with the specific details. The popular app, which can identify song names on the spot, started to temporarily “forget” the names of songs and artists. Once the app “remembered”, users would be directed to a page on Alzheimer’s awareness and encouraged to donate. What were your favorite ads from May? Let us know in the comments.